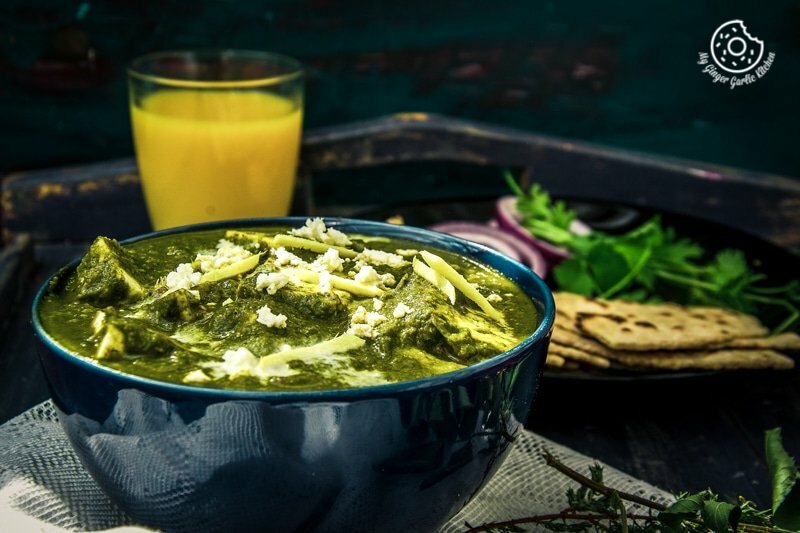 Detailed Palak Paneer recipe with step by step video tutorial. 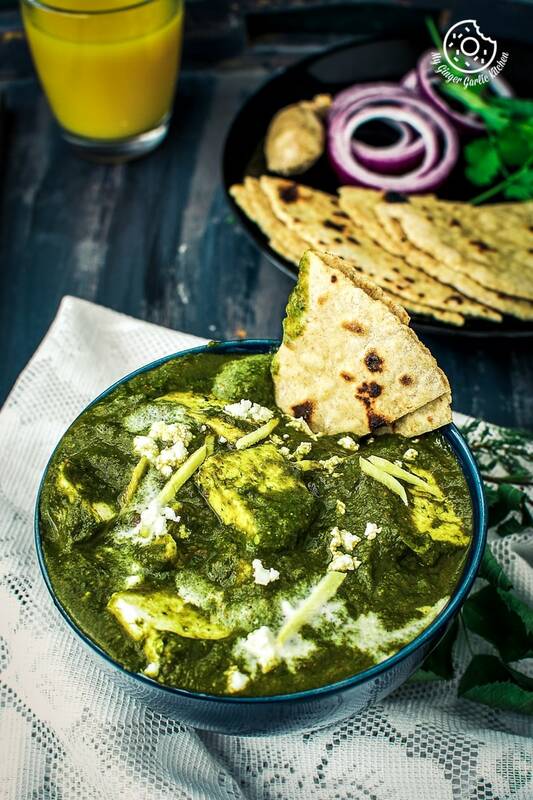 Palak Paneer is one of the most popular and scrumptious North Indian curries. In this recipe, Paneer cubes are cooked in silky smooth spicy spinach puree. This palak paneer curry is so perfect for an easy weekend or weeknight dinner. The only way to lift-up the mood during the breezy and dark climate is everything curry in my lexicon. And today I have decided to share one of the most common and popular Indian curries which you might have dined at Indian restaurants. These days I am all-in for traditional and authentic dishes. My reason? It is pretty simple. Lately, I am getting a lot of frequent requests on sharing some particular Indian dishes. My friends and audience want to see my way of making some of the very traditional and authentic Indian recipes which I haven’t posted on my blog yet. The good thing is that all of these requested recipes are simple and basic. These are especially the ones which they can get anywhere. These are the dishes which are being cooked in Indian families for many years. So I was kind of surprised when I got such requests from the natives who know it all. When they asked, I was like “why do people need these simple and basic recipes? And why are they asking me to share it when they can get it anywhere?” Also, another interesting part is that their requests are not impulsive. They are really genuine because they keep reminding me every once in a while about their requests. 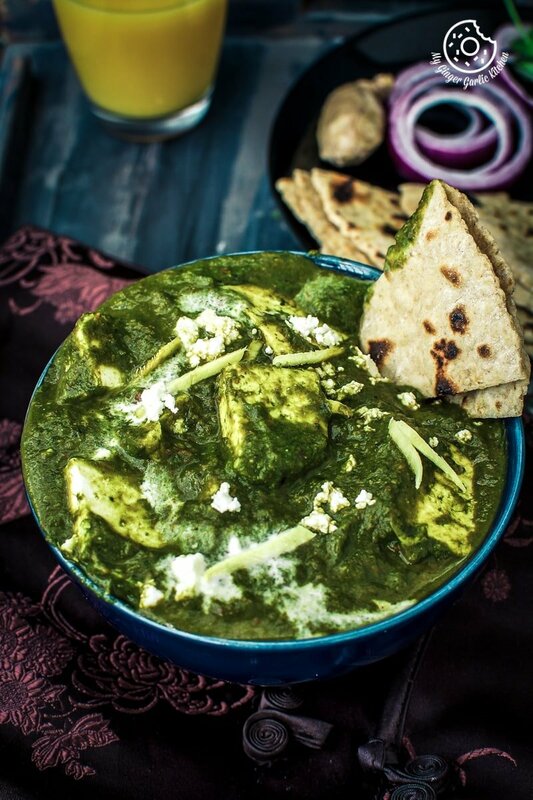 So here is one such recipe on my audience’s demand — Palak Paneer aka Spinach Paneer Gravy. 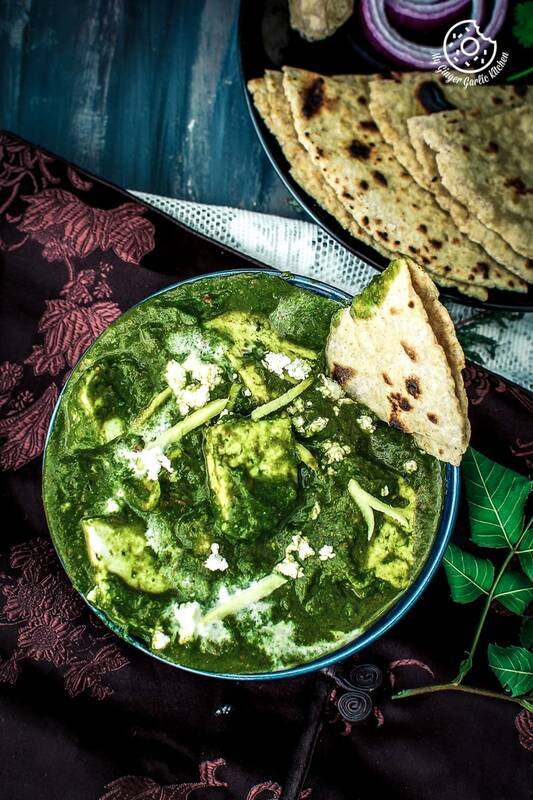 I just can’t hide my passion for this Palak Paneer | Spinach Indian Cottage Cheese Gravy recipe. There’s just something about all the curry dishes — they would attract you, no matter what your age is. Now in my home, I am not the only one who craves for curries every once in a while. Lately, little ‘A’ has also started demanding curries and naan. And this conversation goes on and on until she gets to eat curry with some naan, paratha or rice. I kinda fancy these tiny demands of her and try to fulfill them whenever I can. It’s such a blessing when you know what kind of food your child enjoys with all her heart. And the most satisfying moment for me is when I hear a humming sound while she eats what she loves. That is the moment when it seems like all my efforts were totally worth it. There is definitely a little foodie inside her. 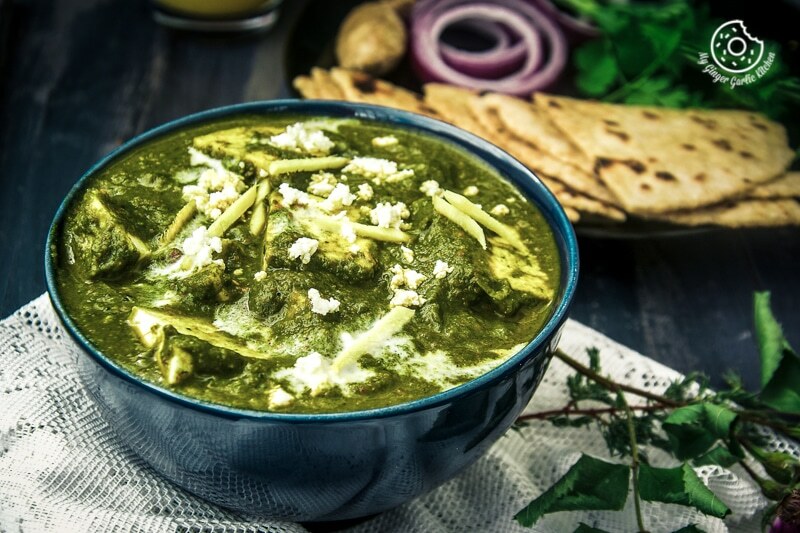 About Palak Paneer, it is a popular classic North Indian curry. This is one of the most loved curries by North Indians. This curry is a true classic that everyone can love. And yes, I understand that spinach might be a turnoff for some people. But there’s a way out. As a child, I never liked spinach other than the one presented in the pureed form. And that’s why I love this spinach curry because this is so creamy and you don’t see any spinach leaves in there. Imagine how healthily nice it is when you include lots of green with lots of cheese. This palak paneer curry is so perfect for an easy weekend or weeknight dinner. This curry is the ultimate comfort food. Making this curry is super quick and it tastes delicious with naan, roti, paratha or with rice. The curry is made of pureed blanched spinach and paneer (aka Indian cottage cheese). Blanching helps the spinach to retain its green color. I use the remaining water for making roti dough to make sure that there is no loss of nutrients. But if you want to healthify it even more, then I would suggest you to make raw spinach puree by adding a little water. This simple recipe can be prepared in many different ways. 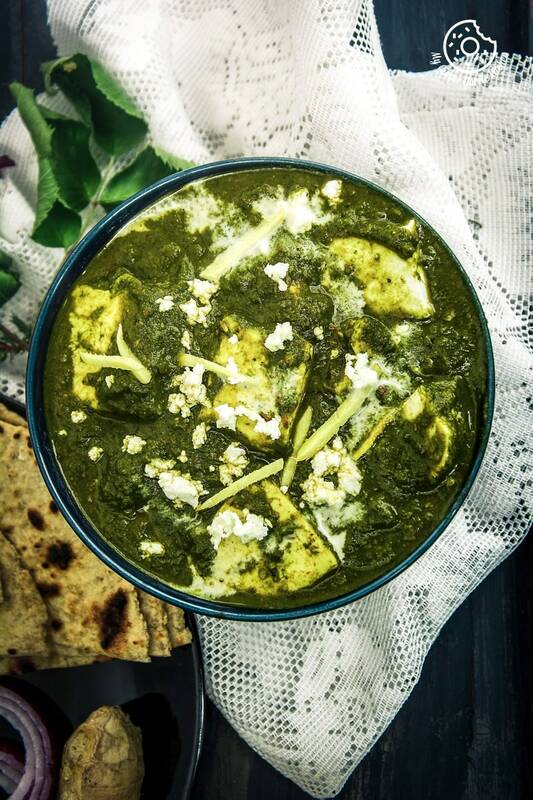 Today I am sharing the way my Mom uses to make palak paneer. To make this palak paneer vegan, you can simply swap paneer for tofu and milk cream for nut cream or nut milk. On this website, you can also find some other delicious vegetarian curries which you might interest you. They are Jaipuri Aloo Pyaaz Ki Sabzi, Rajasthani Gatta Curry Recipe, Mughlai Navratan Korma, Restaurant Style Shahi Kaju Curry, Lehsuni Dum Aloo, Dhaba Style Malai Kofta Recipe, Restaurant Style Matar Paneer Curry, and Restaurant Style Paneer Do Pyaza. 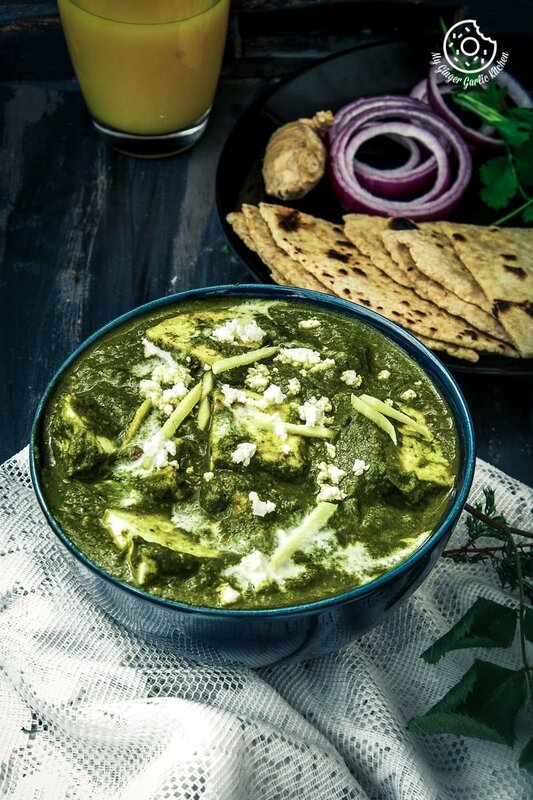 Palak paneer is one of the most popular and scrumptious North Indian curries. In this recipe, Paneer cubes are cooked in silky smooth spicy spinach puree. This palak paneer curry is so perfect for an easy weekend or weeknight dinner. 1. Wash spinach leaves, and pat them dry. 2. Boil 2.5 cups water in a pan. Add spinach leaves to it and boil for 1 minute. 3. Turn off the heat and let the spinach stay there for 1-2 minutes. 4. Drain the excess water from the spinach with a slotted spoon. 5. Reserve this spinach stock for curry. 6. Put ice cubes and water in a large bowl. 7. Now add the blanched spinach leaves to ice water and leave it in the ice bath for 2-3 minutes or until it is no longer warm. 8. This will stop the cooking process, and retain the color and nutrients. 1. Heat oil or butter in a pan. 2. Add the cumin seeds and let them splutter. 3. Add chopped chilies and sauté them for a minute. 4. Add chopped onions, chopped ginger, and chopped garlic. 5. Sauté them for 2-3 minute and add cashews and chopped tomatoes. 6. Stir well and saute the tomatoes till they are softened. 7. Turn off the heat and let the mixture cool down. 9. Heat oil in the same pan. 10. Add black cardamom, cloves, and peppercorns. 11. Now add roasted cumin powder, Kasuri methi, coriander powder, turmeric powder, red chili powder and let them sauté for 30 seconds to 1 minute. 12. Now add tomato onion paste and stir well. 13. Let it cook for 3-4 minutes, keep stirring occasionally. 14. Add spinach puree and cook for 3 minutes. (You can also about to ⅓ cup of the reserved spinach stock or water if you want semi-liquid gravy). 15. Now add salt and mix well. 16. Add fresh cream after 1 minute and mix well. 17. Now add in the paneer cubes and mix gently. 18. Let it cook on low heat for 2 minutes. Remove from heat. 19. Garnish with ginger juliennes, fresh cream and crumbled or grated paneer. 20. Serve hot with garlic naan, stuffed naan, paratha, or rice.